Once Cento and I were installed in our room, Jutta took off for her class reunion, which was being held at another hotel in a nearby town. She would spend the weekend in company of her high school classmates. 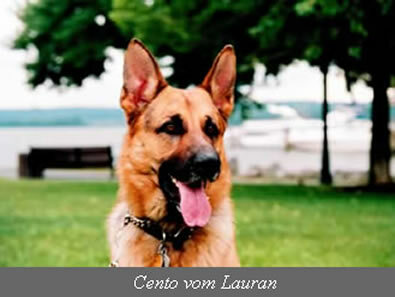 Cento was a model German Shepherd Dog -- calm, composed, intelligent, and, of course, beautiful! Once Jutta was gone, Cento and I decided that the first order of business was to have dinner – my dinner! Cento and I went down to the main dining room. He dutifully sat next to me while I had a lavish German dinner. The waitress brought Cento a bowl of water, and many guests stopped by to pet him – a greeting process which he obviously relished. A woman walking into the dining room stood staring at Cento, as if mesmerized. She looked at me, and exclaimed pointing at Cento “Schoen!” How beautiful! As the dining room filled and the traffic into the dining room slowed, Cento stretched next to my table and went to sleep. The next morning, Cento and I explored the narrow streets, admired the old buildings, and walked through the fields. Cento did not miss an opportunity to mark the trees and the vineyards. I decided that Cento had taken possession of St. Martin! When Jutta returned from her class reunion, we all journeyed on by car to France for a few days, and then drove back to Wuppertal in Germany, Jutta’s hometown.